Studio21 Architects connect homeowner’s contemporary design with historic farmhouse guidelines. An interview regarding the firm’s design+build process. When architect Bill Styczynski first met with potential clients at their recently purchased, run-down home, he knew almost instantly the property was due for a rebirth. The clients knew this as well but were willing to hear a professional opinion before making a final decision. Styczynski is the principal architect of Studio21, which uses an architect led design+build process for many of their projects. 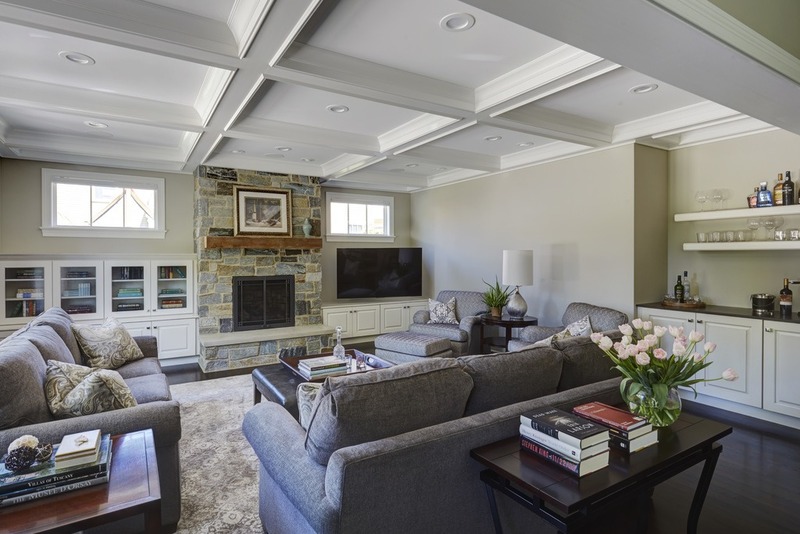 His team took on the role of both architect and builder for this project in the Olde Schaumburg Centre Historic District in Schaumburg, Illinois. The clients are a husband and wife who purchased the home for the location with a possibility of a whole house renovation or tear down if necessary. “They are quite honestly the type of client we’re looking for, clients who can appreciate a well-conceived design and also appreciate the knowledge of construction that we can bring to the project, with one source of responsibility,” he says. Located in the historic district, the clients and the community wished for a renovation of this existing home, but Styczynski noticed major structural and foundation issues that could not be ignored. “It was a prime candidate for a teardown,” he says. As typical of their design process, the architectural team took the time to fully understand their clients’ needs, desires and lifestyle. Once they understood the clients’ needs, they focused on meeting the criteria of the historic district, including presentations to the historic district committee. After nearly unanimous approval of the design by the Olde Schaumburg Centre Historic Committee, demolition began in mid-November 2014. After nine months of demolition and construction, the 3,500 square foot home was completed for the couple in August 2015. The architectural team, including Gregg Stahr, the project design architect, blended the homeowners’ contemporary interior design wish list with the historic district’s guidelines for a historic farmhouse character and charm, including a large wrap-around porch, three light window glazing and wood siding to name a few. Although the clients were involved with their commercial hardware business, they also enjoyed being part of the process and were informed on an almost daily basis of the progress. “The whole process of designing and building was really exciting for them,” Styczynski recalls. The architects considered how the home design would affect their lifestyle, which focuses on their family and pets, so the design even including a dog wash station just inside the mudroom door. The first floor is designed for one level living. The client’s primary criteria was a ranch style first floor, then a second floor for three guest bedrooms for out of town visiting relatives and other guests. As part of the desire to host family gatherings, natural light flows from the open-concept kitchen to a large dining table in the great room. The clients also possess a more traditional mindset because they opted for a formal dining room, but not a formal living room. 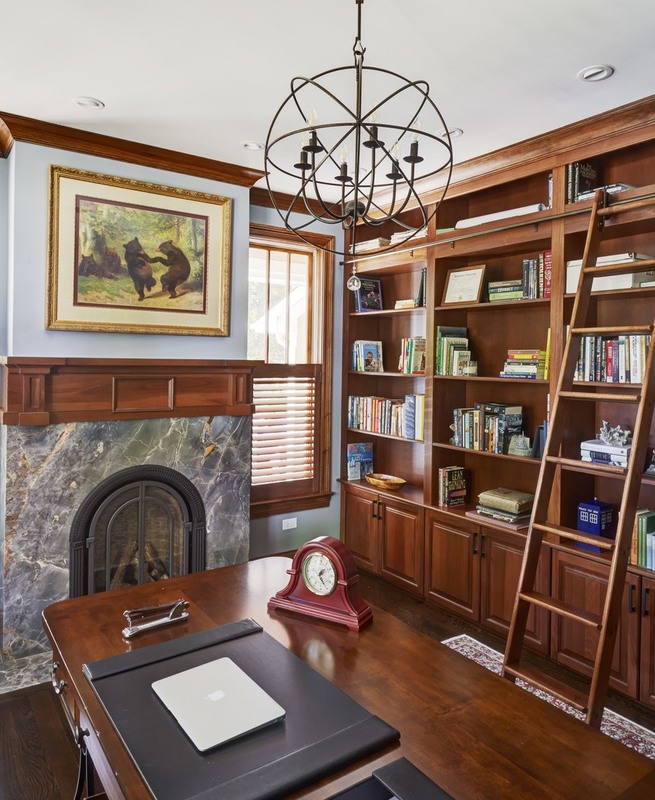 The library offers a place for reading a good book next to the fireplace, or working from home. The main challenge, as with most projects, was balancing the design with the budget. Cost estimating was performed early in the process, with the cabinetry cost taking on a higher portion of the budget than originally expected. However, the owners were made aware of the options and were pleased to get the higher quality that went with these extra costs. The design and construction included a collaboration of multiple professionals including the interior designer, cabinet designer, low voltage, landscaper and other consultants to create a contemporary farmhouse feel. During construction and to everyone’s surprise, the clients sold their former house earlier than expected. With their closing date approaching, the team felt enormous pressure to finish the project. After communicating effectively with all parties involved, Styczynski achieved a temporary occupancy for the clients to move in with their furniture while finishing touches were completed. Construction management software was also utilized to communicate with the clients during construction, including a real time update of the construction schedule and a format for centralizing communications that all necessary parties could share. Reflecting on the whole project, Styczynski feels confident in the efficiency of their design+build process. Because of his dual perspective on both design and construction, he embraces problem solving as an integral part of his professional experience. “I don’t see anything as an insurmountable challenge as much as it is something you just need to find a solution and get the job done.” he says. His team ensured that the house was designed to meet the historic district’s standards from the beginning, so that they wouldn’t have to redesign and resubmit. Taking the time to do this is essential for a smooth project experience. “We took all those worries away by designing something that was [basically] already approved,” he says. The historic committee is pleased with the exterior because of its look, and the feel fits in with the community. The house is located close to the sidewalk, reminiscent of days gone by when neighbors would stop and chat … offering a refreshing connection to the past. The clients are enjoying their new home’s modern amenities and casual historic atmosphere.